This is a guide to building your very own caster Amazon around the newly introduced Storm skill tree. We will focus on the strengths of the tree and support our character with one of the best open skills in the game in order to excel at both area of effect and sustained single target damage, while remaining versatile thanks to the unique features of our support skills. If you ever wanted to play an endgame viable caster version of your favourite character, without having to obtain super rare gear and without the restrictive and unsatisfactory playstyle of the blood tree, then you are in for a treat. This build requires a realm only runeword to reach its full potential. While single player alternatives will be provided your character will have a lower damage output without it. This build is not suitable for absolute beginners. The power level of the character while levelling through the first difficulty is not sufficiently high to allow for smooth sailing if you have no idea what you are doing. Level a different build to 120 by yourself first and tackle some easy Ubers before deciding to roll this character. PLAY: Here you will learn everything necessary to build and play your Stormcaller. This section will not include any reasoning behind why choices have been made in order to keep it as brief and to the point as possible. This means that if you just want to Alt-Tab quickly while playing to see how you should orb or socket a particular item, or if you want to get the key strategy to beating a certain boss without having your hand held every step of the way, you will no longer have to read through walls of text. workshop: This section contains the decision making behind every single aspect of the build. If you are a player who is interested in learning how to theorycraft a character from the ground up, or if you are curious about the inner workings of Median XL and its myriad of mechanics you will find what you seek here. One of the best single target spells in the game. It creates a raging blizzard on the head of your target which lasts 10 seconds. The high duration enables you to stack this effect many times and demolish all stationary enemies within seconds. Amazons are the class which can obtain the highest level of this spell, thanks to some class specific equipment, and it perfectly resolves the number one omission in our skill arsenal. Our innate skill. It is a buff which grants 10% spell damage and 15% enhanced weapon damage to the party. The duration increases with your character level. Truth be told it is the weakest innate skill in the game. However we will enhance its power massively through several items later on and turn it from zero to hero. A melee attack which requires a sceptre. It transfers your weapon damage to a number of lightning bolts which target enemies around you. The skill also adds some flat lightning damage to your attacks which makes it useful for starting your character off in the Blood Moor. The cornerstone of our build. Every cast triggers an invisible nova which hits all enemies on the screen, dealing physical and lightning damage. The dual damage nature of the skill means that in the endgame you will be able to clear both lightning and physical immunes equally well which will enable you to keep up the pace no matter the resistances of your enemies. A blessed hammer sceptre which deals 3/4 weapon damage and adds a flat amount of lightning spell damage. This skill has good scaling and will be our single target killer throughout Hatred difficulty. However its clunky spinning pattern combined with the necessity to be stationary in melee range to maximise damage are the reasons why we will be transitioning to Hailstorm later. A superb passive which grants us a big chunk of flat dexterity and energy, 5% total character defence per level and 1% lightning resistance pierce for every hard point invested. It supports the build on so many levels and gives a cool dark look to our character to boot. Definitely one to max without looking back. This is a skill which creates several pulsing lightning flashes within an area around your character. These hit very fast and carry weapon damage. However because the number of flashes provides an insufficient damaging density and the area of the field is nothing special we will be skipping this one. Passive. It grants increased velocity, with diminishing returns, for every hard point invested and faster hit recovery. Initially while we have spare skill points we will be investing some here for the big mobility increase it provides. Later when we have a large amount of +skills we will leave it as a pre-requisite. The minions which will keep the baddies at bay throughout the game. They are immune to fire and benefit from all the passives on the Neutral Tree. What is great about these minions is that they will have good survivability in the endgame with just a single point invested here. In addition when they die they can cast a very strong fire cannonade spell which will help you deal with lightning immunes early on. Another passive which gives a flat defence bonus to your character. The bonus has increasing returns for every hard point invested. Thus we will be maxing it out in order to have the best possible protection versus melee and ranged attacks. A buff which grants big magic damage to our attacks, increases our attack speed and sets our defence to 0 as a trade off. We are building a caster however so leave this one as a pre-requisite. Yet another passive, which enables you and your fire elementals to drastically slow down the movement, attack and cast speeds of enemies which hit you with a weapon attack. It gives 2% extra slow attacker per hard point and is the key to enabling your elementals to survive and keep enemies debilitated for you. The reward for completing the Ennead Challenge. This is arguably one of the best crowd control spells in the game. It slows all targets in a cone in front of you by 50%, debuffs their physical resistance by 50% and gives a huge life bonus to your elementals for every hard point invested. We will be investing some points here to beef up our summons and also to reduce the cooldown timer, which will enable us to reduce the time our teleport skills will be locked out. Our reward from the Black Road challenge. This is a buff which periodically shoots a nova of spikes when there are enemies near you, it also grants more crushing blow for every hard point. Our good passive dexterity will allow us the luxury of being able to wound enemies and stop their natural regeneration with only a single point. A definite advantage over many other casters. This will be the uber skill we pick up at level 90. It grants you a big passive bonus to vitality for every gem socketed in your gear. It will enable us to survive well in destruction difficulty and get started with the endgame uber content. Raises an invulnerable ghost from a corpse which reanimates monsters to do her bidding and has an aura which will increase the maximum life, physical, magical and fire spell damages of the party. This is our core endgame uber skill to which we will transition once we have progressed sufficiently through the content. The first thing you should do is eat your money token and head over to Akara and buy any sceptre you can afford, preferably a non-magical socketed one. Go outside and start whacking at stuff until you level up. Put your next two skill points into Thundercrack and then two in Wild and Free. Keep whacking at stuff until you get to lvl 5. At this point summon Volrath in an area you already cleared and start running in a circle killing the traps. They will go down reasonably fast, but Volrath will pose a problem as Thundercrack deals virtually no single target damage. If your sceptre costed less than 500 do invest in a +10 max damage mystic orb to speed this up a bit. Once the boss is dead and you have your Harkon Crystal head over to the den of evil. At level 6 pick up Summon Fire Elemental and get your army up - they will help you clear stuff faster than you can by yourself right now. At 7 and 8 put two points into Stormcall and start using it all the time to aoe. Shield runeword. Keep remaking your chest runeword whenever you find better base armours with a good defence upgrade. gloves. At level 53 gamble a rare amulet and start rerolling it with oils of renewal until it spawns with the Hailstorm oSkill - don't worry too much for the other affixes for now, we will be remaking this proper once we reach higher levels. Once this is done you are ready to go back to Hatred and complete the Ennead Challenge. After that you are pretty much set to progress through the game to level 90 where you will respec to the early game build, complete the Level Challenge 2, and then carry on until 120 while tackling the minigames through your Terror journey. Below is the gear that you should aim to complete around level 90. Orb with 15 Faster Cast orbs, 15 Life after each kill, remaining space with lightning spell damage mystic orbs. Socket with Perfect Diamonds. Orb with 15 Total Character Defence (TCD), Enhanced defence until 350% and fill the remaining space with All resistance orbs. Socket with Perfect Bloodstones. Body armour When you get to level 85 gamble a tier 6 Light Plate and upgrade it to rare if it was magic. Reroll with oils of renewal until it spawns with +2 all skills and 250% + enhanced defence. Socket with 2 Perfect Bloodstones and 4 Perfect Onyxes. Orb with 15 TCD orbs, 15 lightning spell damage orbs and fill the remaining space with magic/phys spell damage. Socket with 2 Perfect Turquoises. Make this runeword in a Tier 6 Spangenhelm. Orb with 15 TCD orbs, 15 Enhanced defence orbs and fill remaining space with lightning spell damage. Socket with rare jewels with 40+ life. Make runeword in a pair of Tier 6 Gauntlets. Orb with 15 TCD orbs, 15 All Resistance orbs and the remaining space with lightning spell damage. Socket with rare jewels with 40+ life. Orb with 15 TCD orbs, 15 lightning spell damage orbs and the remaining space with run/walk speed. Socket with 1 Perfect Turquoise and 3 Perfect Ambers. Jewellery Rare amulet with Hailstorm and rare rings with +1 to all skills. Level Challenge 1: Keep your fire elemental army up and spawn elementals at the edge of your screen while moving forward in order to draw fire and slow enemies. Kill everything with Stormcall and bosses with Hammer of Zerae - the lightning immune boss will take some time but keep her surrounded with fire elementals and their on death proc will take her down. Ennead Challenge: make sure you have your Hailstorm amulet + Bona dea runeword first. Keep summons up, stack Hailstorms on the totems and use it to kill lightning immunes. Kill non-lightning immune skeletons with Stormcall. When you approach every necromancer spawn a fire elementals one by one ahead of you to avoid a Miasma targetting you. Kill them with Hailstorm. Level Challenge 2: Buy and cube 3 meditation candles & £ sacrificial hearts to make the book of summonning. Summon them in a corner and run away. Then snipe them with Hailstorm from a distance while maintaining summons to tank spells. Really easy and no stacked resistances necessary. Black Road Challenge: Reward is not mandatory for us so we skip this during the levelling process. We will come back here once we have obtained some Destruction charms and transitioned to the Early Game Gear. This phase of the game starts once you enter Destruction. Stats: Enough strength to wear your gear and everything else in energy. Storm Tree: max Asterism and Stormcall. 1pt in pre-requisites and 0 in magnetic field. Neutral Tree: max Balance. 20 poins in defensive harmony, 3 in Wild and Free and 1 in all others. Reward Tree: 15 points in Spellbind, 1 in War Spirit, remainders in Paragon. Breakpoints: 120% FCR for a 7 frame cast animation with 1 handed weapons. 174% FHR for a 4 frame hit recovery animaiton. 280% FBR for a 5 frame block animation - only useful for the Brother Laz uberquest, ignore otherwise. Gameplay: Weapon switch and prebuff yourself with bloodlust. Kill regular enemies with Stormcall and bosses with Hailstorm. Use Spellbind against lightning immune monsters to enhance Stormcall's damage as well as versus all bosses to reduce their weapon damage and slow them down significantly. Keep your Fire Elementals around which will massively slow down all monster which strike them. Always hold down the mouse button when casting your spells to make sure you are fully utilising your cast speed. By far the best one handed weapon for this build early on. Thankfully Stormcall does not have a Sceptre restriction like the rest of the storm skills. Try to reroll this until you get one with +3 all skills. It gives both lightning and cold spell damage which boosts our AoE and our single target. The 40% to elemental resistances allow us to have more mystic orb space to enhance our protection against attackers and to stack lightning spell damage on the other armour pieces. In addition the magic damage reduced will enable us to survive Quov Tsin's trinity beam even without 95% resistances. Orb with 15x Life after Each kill, enough Faster Cast Rate orbs to reach the 120% breakpoint and fill the rest with Lightning Spell Damage. Socket with Perfect Diamonds. The stats on this shield are great for shoring up our weaknesses early on. The high base defence and TCD synergise with our defensive passives. The huge bonus to strength allows us to equip the heavier armour pieces without significant strength investment. To top it all off we get a massive boost to minion survivability and 10% damage reduction. This piece has all the best defensive and utility stats in one place, and while it does lack in offence it is the best choice. Note that it does penalise your velocity, which is why we invest several points into Wild and Free. Orb with 15x TCD, Enhanced Defence until 350% and then fill the remaining space with All resists or lightning spell damage. Socket this with Perfect Bloodstones to enhance the survivability of your summons. This low level runeword has finally found the build which will make it shine. Make this as soon as you can and it will be use it for nearly the whole game. At max level it grants 120% lightning and cold spell damage and 40% pierce to cold and lightning - which enables us to cap our lightning pierce together with Asterism "for free". On top of this the 40% faster cast rate is super useful once we transition into the midgame as our cast speed breakpoint will change. Try to roll one with at least 11 to Hailstorm. The other oSkill unfortunately is not useful. Orb this with 15x TCD mystic orbs and 15x Enhanced defence. Fill remaining space with lightning spell damage orbs. Socket with rare jewels with at least 40 life and one of: 2% bonus to Energy or 2-3% lightning spell damage or 2-3% magic/phys spell damage. Keep your eyes open for a Sacred Light Plate and reroll it to rare with the Act 2 Dragon recipe on Destruction to ensure that it will have max item level for crafting. Roll it with Ornate shrines until you obtain at least the must have stats then bless it with an Ornate shrine. Try the Blessed Oil of Luck on it first and then orb the armour with Enhanced defence to cap, finally fill the remaining space with Total Character Defence mystic orbs. Socket with 2 Perfect Bloodstones and 4 Perfect Onyxes. The best source of shrines at this stage of the game is Terror Fauztinville or Terror The Void. For the latter if you get the Arcane Sanctuary or Docks tileset maps use dark summonning to kill Eternal Ghosts which always drop 2 shrines each. If they are immune to cold go to town to reset their resistances. Yet another great caster tiered unique that fits our paradigm. Both cold and lightning spell damage, a good chunk of resistances, FCR and magic damage reduced. Add 15 TCD orbs, 15 lightning spell damage orbs and fill the remaining space with magic/phys spell damage. Socket with 2 Perfect Turquoises. There are no great high level rare affixes that spawn in this slot and the tiered unique department is lacking. Therefore we will essentially create a "Double shrine bonus honorific" with as low of a level requirement as possible. To do this grab any pair of Sacred Greaves. If they are not of magic quality, cube them with a catalyst of destruction + a rune to make them white and then uptier them with an oil of enhancement and a rune. Once they are magic cube them with a magic ring and a magic amulet - this will reset their ilvl to 1. Now uptier the boots to rare with an oil of enhancement + a rune in the cube and begin crafting them with an Ornate shrine, followed by an Ornate shrine bless after you get good stats. Cube with 15x TCD mystic orbs afterwards and fill the remaining space with lightning spell damage orbs. Socket with 1 Perfect Turquoise and 3 Perfect Ambers. Even though we give up 4 sockets worth of gems, these gloves are slightly better than a honorific or crafted alternative. Their main benefit is the +10% max fire res, which will allow us to reach 95% fire resistance with Azmodan's heart, and the +2 all skills are great because they also buff Hailstorm. Cube with 15x TCD orbs and then fill the remaining space with lightning spell damage & magic/phys spell damage or all resistances if you are not capped. Socket with rare jewels with at least 40 life and one of: 2% bonus to Energy or 2-3% lightning spell damage or 2-3% magic/phys spell damage. Gamble a rare amulet once you are at least level 95. Reroll it with oils of renewal until you get the recommended stats and at least one of the optional ones, because their stat budget is amazing. While this may seem tedious you will be using this amulet for the entire uberquest content so think of it as time invested rather than wasted. Prioritise a higher roll on the Hailstorm oSkill compared to the +All skills roll. For example if you have an amulet with +3 All skills and 29 Hailstorm, choose it over one with +5 all skills and 22 Hailstorm. Cube it with 15x Cold Resistance Pierce orbs and fill the remaining space with lightning spell damage. Same story as with the above amulet, these jewellery pieces are crucial for us to reach 100% cold pierce for our single target spell. The optional affixes on the ring slots are weaker than the ones that can spawn on the Amulet however, so prioritise a good roll on the recommended stats. Cube these with 15x Cold Resistance Pierce orbs and fill the remaining space with lightning spell damage. This is the entry level prebuff weapon for us, cheap and cheerful. It adds 25% fire/cold/lightning and poison spell damage to your bloodlust. Put it on your second weapon slot and always weapon switch while casting your innate skill. If you wish to enhance the duration equip a Tier 6 Setzschild and socket it with 6 Nih runes. This part of the game begins once you have created your Creep Runeword Staff. Neutral Tree: max Balance. 2 points in Wild and Free, all remainders in Defensive Harmony and 1 in all other skills. Reward Tree: max Spirit of Vengeance, 10 in Spellbind and 1 in War Spirit. Now that we have collected the early game charms and have gear which allows us to reach good damage reduction and defensive values we switch gears and go on the offensive by replacing Paragon with Spirit of Vengeance and maxing it. It provides a massive physical spell damage boost to Stormcall and a big fire spell damage boost to our Pyroblast oSkill and to the Fire Cannonade proc on our Elementals. Furthermore we gain an immortal meatshield generating minion which can indefinitely tank certain enemies if we position ourselves properly. Breakpoints: Our midgame weapon morphs us into a Sorceress and so our animation breakpoints change. We now need 187% FCR for a 4 frame casting animation and 142% FHR for a 3 frame hit recovery animation. The change in our uber skill heralds a complete revamp of our socket fillers. Once you have obtained the Creep your first priority should be the new top casting breakpoint. Roll rare jewels with 40 life and 10FCR or Lightning spell damage or Physical spell damage or 2% energy for every socket. Remember to collect and disenchant all tiered uniques that drop, you will need plenty of crystals to craft good jewels. 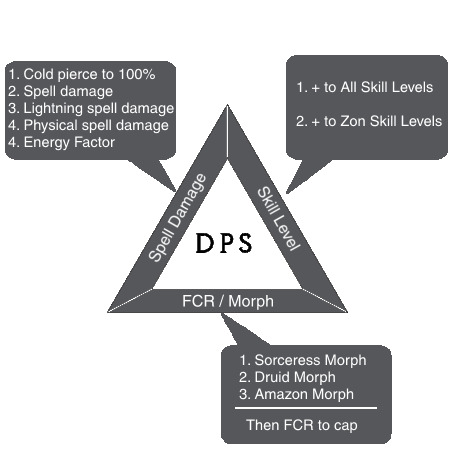 For these we will use the On rune recipe which can add 2-4 life and mana on kill. Use a rare item level 99 jewel as a base. You can roll each one 14 times before the ilvl diminishing renders it unusable. Look for 3+ LaeK & 40+ life & one or more of: [10 FCR (until cap only), 2-3% lightning/phys spell damage, 2% energy]. Remember that because crafted jewels have higher level requirements they will not fit in any low level runewords. When you begin transitioning to them - start socketing them in your crafted and sacred unique items first. Every single item that is part of the midgame set is superior to the equivalent from the early game. Therefore as soon as you obtain an equipment piece you should use it, even if you are yet to farm your staff runeword. The cornerstone of our build. The sorceress morph reduces our cast speed from 7 to 4 frames which is a whopping 43% more TOTAL damage - nothing else even comes close. Use either a sacred or Tier 6 War Staff as a base. Roll it as a superior with at least 100% bonus to Attack Rating before attempting the Luck Trial. Fill mystic orb space with 9x LaeK orbs. This runeword is made with one of every elemental rune. The attack rating is useful in order to enable our War Spirit to better open the wounds of bosses. Apply the same principle that you did to craft your early game chest. NB - do not forget to use an ilvl 99 as base. However this time you will only settle for a better roll that includes flat life and one other useful affix. Orb with enhanced defence until the cap and then the remaining space with TCD MOs. Socket with the jewels described in the above note. Same runeword as in the early game but now remake it in a Sacred version of the base helm for better defence. The base item should be superior with at least 40% enhanced defence, and must succeed a blessed oil luck attempt and roll 2% Damage reduction. Orb with 15x Enhanced defence orbs, 15x TCD orbs and fill the remaining space with lightning spell damage. Socket with the jewels described in the above note. These gloves have a perfect mix of offensive, defensive & utility stats. The 10% damage reduction is insane for this slot and you get free capped enhanced defence. The Pyroblast oSkill and good chunk of pierce will come in handy in several ubers such as farming the Ultra Elementals in the Kabraxis uberquest, clearing several annoying Yshari mobs more efficiently and in some Uldyssian stages. Orb with 10x TCD. Socket with the jewels described in the above note. A spell damage boost to both the physical and lightning portions of Stormcall, another 10% Damage reduction, a big percentage bonus to energy and a hefty chunk of resistances. This belt is pretty much a direct upgrade over our Aerin Orbiter. Orb with 10x TCD mystic orbs. Socket with the jewels described in the above note. Same boots as the early game. Because the required stats are quite easy to roll in this slot you should go for a pair of boots that succeeds the blesed lucky oil trial and gains at least 1% Damage Reduction. Socket with aforementioned jewels. Orb with 15x TCD and the remaining space with lightning spell damage. You are looking for exactly the same stats on your amulet as before. I advise you to keep rolling until you get at least one of the optional stats with the flat life, spell damage and cold pierce being the most important. Same rings as the early game. If you manage to roll them with 1 all skills, cold pierce & spell damage you will not regret it, although it could take a very long time. The bloodlust oSkill on this item differs from our innate one because the elemental & physical spell damages actually scale with the level of the skill, thus the higher the roll on the Bloodlust level the better. This item is another significant damage boost and you will even be using it endgame if you intend to farm areas with lightning immunes. The druid morph that is applied when this staff is equipped also can come in handy when doing the Wretched hive & Void uberquests. Socket with 4 Nih runes.
. Preferrably with +4 all skills. It has very good stats - all skill levels, good chunk of spell damage, energy factor & energy and almost single handedly takes care of your casting breakpoint. Furthermore +5 max all res is great protection against elemental damage. It's only downside is that it has 3 sockets. Orb with life after each kill and socket with Perfect Diamonds. Shield - Double ornate crafted Sacred Setzschild. Must have +4 Amazon skills, +(21 to 30)% Physical/Magic Spell Damage, +(20 to 30)% Lightning Spell damage and at least 300% ED. Orb with ED to cap and then with TCD. Socket with midgame jewels. Miscellaneous Gear: This is a collection of items which will make your life easier in various uberquests. 1) Heroic Killer Boots: ZOMG Sacred Greaves like above but this time crafted & blessed with Sacred Shrines. You are looking for at least 25% cold resistance pierce. The aim of this item is to boost your cold pierce to at least 150%. Use these boots for: Astrogha, Kabraxis, Uldyssian prime Edyrems & soul of Pride. Orb with 15x Reduced Enemy Cold Resistance orbs and fill the remaining space with TCD mystic orbs. Socket with midgame jewels. 2) Devouring cloud jewellery: Two rare rings with 1 all skills and at least 15% poison pierce. A rare amulet with the devouring cloud oSkill and either poison pierce or poison spell damage. Orb all three of these with 15% poison pierce each. These items are necessary to complete the "Arihan" stage in the Uldyssian uberquest. , Amulet - use your stormzon one. Socket everything with perfect amethysts. Orb everything with 2 damage reduction and life when struck. You will need to respec to Bow spec for the: Uldyssian boss fight, Ultra Magic & Stone mini bosses, Mephisto & Baal & clearing Diablo's room from Chimaeras in the Yshari Sanctum. Unlike the midgame gear, where you equip every item as soon as you get your hands on it, the endgame set requires several key items to be obtained first prior to making the switch. Therefore only transition once you have the majority of the items. Essentially our plan here is to transition away from Hailstorm into a lightning spell that utilises our naturally high (150+) lightning pierce that we obtain for free. Enter Thunderstone - arguably the best single target spell in the game available as an oSkill on a very rare armour piece. Once we do this, we rework our jewellery for maximum focus on lightning spell damage and we reach the cap of 50% damage reduction on the armour pieces while picking up some damage upgrades there too. The Creep Runeword - This runeword remains your best option by far even into the endgame. - The core item of the endgame setup. It allows us to transition from Hailstorm to Thunderstone as our single target killer spell of choice. Not only is Thunderstone the superior ability, but this armour also allows us to make use of our innately high lightning pierce to maximum extent and also frees up our helm & jewellery slots for a better items on top of granting a massive 15% DR.
- Best choice because of good offensive stats on top of 10% DR. The big chunk of MF is always welcome too. - Must have +2 to Amazon skills obviously. We give up some damage stats on this equipment slot in order to reach 50% damage reduction. The life bonus is nice too as we have good flat life rolls on all jewels. - Not much to say, the best in slot choice for any caster build in this game. However because we lose out on 10% damage reduction from Greg's gloves only upgrade to the Lamha once you have the other items first. - The high spell damage, big bonus to energy and high life after each kill make this superior to rare alternatives. However if you cannot get one with at least +3 to all skills then a rare with +5 skills, 40% lightning spell damage, Flat life and Energy Factor will be better. - Give a bit less damage than rare alternatives, due to less MO space, but in return grant very good TCD and the FRW bonus is a nice addition because the sorceress morph slows us down. - Up to 170% free elemental spell damage on our bloodlust? Yes please.
. This staff is great. It has massive chunks of two defensive stats we are very keen on - TCD and Life after each Kill. Of course it also has great offensive stats with All Skills, Spell Damage, a trinity of when Slain procs, FCR and a big bonus to energy. Easy - to be done with early game gear. Tricky - require at least the Creep Runeword staff. More midgame gear will make your life easier. Hard - require full Midgame gear. If you are not experienced with them, they will need more practice to take down. The following strategies have been employed by me with this character. If you wish to learn in detail about an Uber's mechanics (and don't mind spoilers) please refer to the appropriate section of my Tantrumdin or Bowazon guides. Death projector - lure some mechanics away first. Do not use any summons, they will run into the beam and the splash will kill you. Hailstorm it, it will most likely spawn an alternative direction beam so be ready to blink across it. Creature of flame - Hailstorm it and hide behind corners while it dies. Infernal Machine - presummon elementals, as you enter run to the south west. Hailstorm the machine as soon as you see it and keep doing so, while moving away from elites & Deathstrike. Clear elites with Stormcall. Rathma Square - enter with 25 elementals. Blink to the north behind the big tree. Then run down until the end of the hallway casting Stormcall. It is very good here as it will simultaneously clear gorecrawlers in front and behind you. The boss will come to you, spellbind & kill with Hailstorm. Azmodan - as you enter with 25 elementals take a second to notice if enemies stream in from one direction. Go towards the opposite. If the big room you now enter is relatively empty, walk in vision of the central room and the boss will come to you. If the big room is full, keep running along the outer edges of the dungeon until you find a safe spot to start clearing out non-immune elites. Cathedral of Vanity - When you enter try to lure Inarius and as many nuns into this little chamber. Once you do blink next to the pillar to your south. The crystal ball's death beam rotates in a counter clockwise direction starting at 5 o-clock so move along the left side of the chamber and then Hailstorm it until death. Drink pots to prevent dying to the clerics. Afterwards clear the boss and dark summon the extra. Vizjun - respec to spearzon with TU6 maiden pike. Put enough pts in strength to wear TU6 spangenhelm, rest into dex. Replace glove runeword with honorific TU6 gaunts MOd with max tcd, max dmg reduced by 2, max ED, and max life when struck. Fill all sockets with pgems. Supermax paragon, balance, lioness and put around 10 points into wild and free. Remainders in wild hunt to increase duration of takedown. Now run to the MCS and purify it. Poke a monster along the way to activate Takedown. If you get surrounded/stuck use pounce to blink to the outer edge of the monster congregation. If once you reach the MCS it is completely surrounded and you cannot purify just remake the game. Toraja - our elementals have high life and slow all enemies by 60% when struck. Keep replenishing all summons and casting Stormcall to clear out minions who are not immune. Move north and when you reach Lillith's room fall back a little and wait for her to come. Spawn Edyrems on her and Hailstorm her. Startled Witch - Amazons are excellent witch killers. Respec, put all points into dexterity. Max out paragon, balance & bacchanalia. 1pt war spirit, 5 pts in wild & free, 15 pts in def harmony rest in spellbind. Equip TU6 hard leather armor, TU6 bone shield, TU6 heavy boots and TU6 chain gloves, helm you can use anything really. For the rest of the gear you can use early game pieces. Socket Perfect Amethysts in Rainbowcleave and everywhere that gives 5% dex. In the shield socket resistance gems. You don't really need any mystic orbs. Go to the witch, lure her to a crossroad free of mini witches, purify her and run around while war spirit and the arrow proc on your chest keep her wounded. Purify on CD for more damage. Be careful not to die by the mini witches' missiles, if the boss is near them she will heal. Use a Cathedral of Vanity trophy on your Sleep charm. Uldyssian - kill totem stage with Hailstorm. Hailstorm down all non-cold immune enemies. When you get to Arihan kill him with dev cloud using your special jewelery. Kill cold Edyrem with Pyroblast from our mg gloves. For the heroics just spam Hailstorm on them and they die in 1 res drop with your cold boots equipped. For Baal don't use fire elementals and let SoV keep him busy at the edge of your screen. For Uldy - bowzon respec. Max paragon, dragonlore, war spirit, spellbind, barrage, 15 def harmony, 1 in EF, rest in wild & free. Get as much dr as possible. Keep him spellbound to reduce his dmg output, then run around and maintain OW after purify. When he gets low trap him in top left corner, keep him on the edge of your screen and spam barrage. or Liche Form from Longview secret RW. Pride is hard - use your Spearzon offspec to reach him. To kill him respec back to storm, keep summons with you enter TP and Hailstorm him. Switching to Shamanka and back dispells his cockblock debuff. For the final battle respec to bowzon. Phalanx is great at keeping both bosses wounded and barrage makes short work of the skeletons. Kill Rathma first and then Mendeln - for more in depth info see my Tantrumdin guide. Butcher - Summon two of them to have more pentagrams. Binding of baal - precast 25 elementals, summon them and run away. Hailstorm from the edge of your field of vision. Assault on Mt. Arreat - Ditto above. Take cover behind the pillars from the guard tower fire. Akarat - Ditto above. If Akarat is left alone at the end summon another pack on the Hailstorm. Legacy of Blood - precast 25 elementals, summon in a corner. Fill your sockets with Perfect Bloodstones to reach 95% fire resistance. Hailstorm them all. If all your minions are dead and Bartuc is still alive go down to the tower level 1, resummon, go back up and instantly spellbind him. Aldric Jitan - precast 25 elementals, summon inside the temple and run away. Kill minions one by one from outside with Hailstorm. Once only Jitan is left spellbind him and stack Hailstorms on him. His life regen is no problem. Judgement day - keep recasting elementals, while Uldyssian and his Edyrem are fighting them. Once an avatar spawns drink a potion, spam Hailstorm on them and move a bit to avoid any nukes. Don't let all your elementals die. If they shield themselves go to town and wait a bit. JDay Upgrade - same as above but now once you spawn Uldyssian and his pack position yourself slightly behind your SoV so that she tanks all enemies and you don't need to resummon elementals so much. Once the first avatar spawns, Hailstorm it down. Wait until the second spawns, if it is not the complement to the first or if your swirlies run out remake the game. Zorun Tzin - Kill him with Stormcall - he moves too much for Hailstorm. Herd rats away once there are too many of them. Purify statues until he spawns one and your purify is on cooldown. Then move him away. Stay close to him to avoid his lethal spell and position yourself so that SoV is tanking the rats. Brother Laz - Get defensive gear, purify him, hit and run. See my Bowzon/Tantrumdin guide for details. or Longview and cycle TP + burn. K3KBA - keep summons up. Hailstorm totems. When you approach necros spawn elementals in front of you so you do not get targeted with miasma. IOTSS - our damage is kind of low for this place in early game gear, so we actually have to *gasp* dodge Reveller apparition spells to survive. Malic is easily killable with Hailstorm while he is busy with your minions. Lucion can be a pain as he is very often cold immune. Khalimgrad - kill avatars with Hailstorm, do not get hit by punishers. Clearing the level fully is tricky without our Mid game staff. Tran Athulua - can be farmed at a decent pace even without our staff. Elementals do not tank arrowsides very well so do not bother to try and keep them up too much. Only spawn a few every now and then to slow enemies. Dodge Arrowsides. Fauztinville - doable in full midgame gear. Our damage is good enough, and we can spellbind Onyx Knights. However 300k def, 30% dr and no great innate healing mechanism means we are squishy here. Therefore speed farming is not possible until in endgame gear. The Triune - Replace 4 sockets with perfect onyxes to nullify Kraken attacks. Archons hurt so dodge as many of their missiles as possible. Move out of the meteors. As far as the boss is concerned... he is completely optional for this build. In fact in 99% of the cases his charm actually harms us since it will make your War Spirit spikes overwrite the slow from your defensive harmony. Speed/spell damage/zon skills/mf cycles are very useful however. The Unformed Land - farm here for your staff after completing all other Easy Ubers. The most important thing is to always keep summons up and always stay behind your minions so they soak up the projectile attacks. If you blink and do not move, you will be invulnerable to the elementals' attacks as your minions will be stacked on you. Hailstorm Terul to death. Kingdom of Shadow - I did this as a Stormzon with the early game gear (just replacing sockets for 95% psn resistance) and it is doable but the margin for error is low. A more straightforward alternative is to respec to Spearzon, max paragon, balance, lioness, then jam remaining points into hyena strike. Use TU6 spear and your poison jewelery. At the bridge blink with Jitan's gate and then go to town until the cooldown is over. When you get to Juris kill him with Hailstorm / hyena strike and TP to town to avoid on death spiral. Bremmtown - yes this is doable in early game gear but the timer will be tight. Stormcall won't do enough damage here without our staff so use Hailstorm only. Take the shortcut (after you enter main corridor, turn left and go down the narrow path), keep your back glued to a wall at all times and spawn elementals ahead of your path to uncover spirits. Duncraig - the Creep is a must. Sometimes you will die from auto attacks if you teleport right into a pack and they all hit, but such is life. With full mid gear this build is great at farming here. For Assur activate war spirit to wound him and then spam elementals on him to keep him busy. He will die from the first successful purify. Yshari Sanctum - need midgame gear here. This level is generally a breeze apart from Mephisto and Baal. The reason for this is that the phys damage of Stormcall is not sufficient for those bosses. So we respec to bowzon - 1pt SoV, max EF, max war spirit, max Barrage, 15pts Phalanx rest dragonlore. See gear in misc section. For Meph blink in his melee, then stand behind SoV - spellbind and spam phalanx on him until he dies. Wait for all kings to die before picking up your belt. Farming the Chimaera's in Diablo's room is also easier with Bowzon (don't summon sov) - just kite them with barrage. For Baal - let SoV tank him and stand close to her so she soaks up fortress arrows. Spellbind & barrage. For Valthek remember to switch back to walking - his mind flay can be blocked and this will save your life when you fail at dodging. Wretched Hive - Don't use SoV for first two levels she just gets you stuck, when you get to the third level try not to eat Punishers by dodging them or summoning elementals in front of you. As for the boss - kill him with Stormcall, keep him under spellbind. Don't activate war spirit otherwise he will heal. Move around the corridors while spamming your skills at him - this makes less maggots hit you. BPR - Position your back to the north against a wall so that stampede does not hit you. Spellbind him and stack Hailstorm on his head. Quov Tsin - Rainbowcleave is great here. Make two honorifics with 155% fire/cold/lightning resistance. Fill remaining space with 2 DR mystic orbs. Raise max fire/cold/lightning resistances to at least 90%. Spellbind him and kill with Stormcall. Belial - Roll map with solid middle. Summon him on the other side of a river and run to the middle. Spellbind him and spam Stormcall, run around solid section to dodge burning nova. Use a RIP modifier ring. Astrogha - More annoying than hard. He teleports when struck so Hailstorm is mediocre and we cannot use Stormcall due to his traps. So just maintain 5-10 elementals to protect you from Darklings while you chase him and Hailstorm. If a totem dies either blink away fast or go to town and wait the debuff out. Kabraxis - Position your SoV between you and the Pillar of Skulls. As soon as he blinks on you spellbind him. Clear skeletons/worms with Stormcall. When no adds are left Hailstorm him. Run in a circle to dodge Balefire but not too close to avoid dying from Broadside and not too far away so he does not jump on your head. Use a RIP modifier ring. For the Magic and Earth Ultra Elementals respec to Bowazon. The majority of the time I have a clear idea of where I want to go with a particular character. Maybe I found a certain oSkill to be both powerful and interesting to build around or I like how some of the character's skills work with each other in terms of synergy and gameplay. However, sometimes you start with absolutely no concrete knowledge of what your main skills would be and no preconceived expectation of the play style. The only thing you have is a vague concept which draws you to the build. This is how I ended up with the Stormcaller. I wanted to make a Storm Amazon for the XVr II ladder season. Mainly because it was one of the trees introduced in the last big content patch which got virtually no attention from the player base. I was also looking for a challenge in playing something more "underpowered" to spice up the uberquests I had already beaten with a handful of other builds. But I had absolutely no idea which skills I would use and how the character was going to turn out when I started playing it. Thus I believe describing it's theorycrafting in full can be interesting and beneficial to the entire spectrum of Median XL players. Veterans can gain insight on organic character development and inspiration on how to create and refine unorthodox and unknown builds. On the other hand beginners are often faced with this exact same conundrum. They wan't to play something because it looks cool, or because the class was their favourite in vanilla and they are looking to explore the Median equivalent. That is, they start solely with a general idea and now they can learn how to take it from the realm of the abstract, optimise it and succeed at the game. Essentially if you learn the principles I will describe in this section, and apply them to any character build yourself, you will never need to read another guide again. So without further ado let us begin. This one should be obvious but you would be surprised how often it is ignored. Even if your chosen class has a build which can reach level 120 in a fraction of the time and effort compared to your project, for example for Amazon these are the spearzon and bowzon, you should not make use of it. While I understand that it is human nature for people to lean towards the path of least resistance - experienced players want to rush through content they have beaten many times before and new players want to have as smooth and easy of a ride as possible - skipping this step will deprive you of one of the biggest sources of knowledge for character functionality and gameplay practice. Furthermore you should undertake the levelling process untwinked. That is without bolstering your new character with charms and gear found by older high levelled ones. This is because we want to avoid one of the biggest pitfalls on the road to becoming better - over reliance on good gear. I will write more on this below, but levelling the way the game was meant to be played will allow you to extract the maximum amount of information regarding the strengths and weaknesses of your chosen build from the process. You will also develop better character control, or in other words the illusive concept known as "more skill" at Median, which cannot be directly taught and easily explained. Pros - Deals weapon damage and so can carry beneficial secondary effects like crushing blow, slow target and open wounds. Automatically targets up to approximately 15 targets end game. Around half of the physical damage is converted to lightning. Cons - Restricted to sceptres which have a very limited weapon damage itemisation. Mediocre damage modifier. Does not trigger "on Attack" events. Lightning bolts do not pierce, meaning that in the big densities of uber levels once a bolt hits its intended target it will not carry on and damage monsters behind it. Verdict - A decent AoE skill for a melee weapon damage character. The damage modifier and okayish delivery, coupled with the lack of passive damage sources in the rest of the tree naturally lead us to choosing Curare as our uber skill in order to get maximum value from Thundercrack. However weak leeching capabilities due to conversion, lack of sustain on the tree and mediocre defensive capabilities mean we will have some troubles surviving in melee without Paragon. Pros - Automatically targets all unobstructed enemies in an area slightly larger than 1 screen around you. No weapon restriction, so we have a bigger item pool from which to choose supporting equipment. Deals damage in two sources. Cons - The Amazon casting animation speed is slow compared to other caster classes and the base damage is not high enough to compensate. One of the two damage sources is physical, which cannot be scaled as easily as elemental. The variance on the lightning damage is massive. Verdict - The screenwide piercing nova is one of the best ways to spread AoE damage so that definitely implies potential. However the numbers on the spell and the fact that half of it is physical mean that it will require some serious scaling in order for the dps to be top tier. This is the only pure caster skill on the tree and there is a lack of a great specialised single target spell. The mixed damage types means that it will be inferior to a pure elemental equivalent (apocalypse) early game, but will be much better later as you save time and points by not having to use a different skill to kill immunes. Pros - Deals weapon damage and so can carry beneficial secondary effects. Has good base damage scaling. Cons - Uses the Blessed Hammer missile chain from vanilla. This means to do optimal dps we have to be standing still in melee to the south of our target to ensure our flying sceptres always hit. Furthermore it can be awkward to aim this ability in tight spaces such as doorways in dungeons and narrow corridors. The damage varries massively. Verdict - While the damage is good the fact that it only hits once per cast and the variance is so large means that the dps output will be inconsistent. Furthermore not only do you have to be stationary to optimise delivery you have to be so in melee, which is too much of a sacrifice the damage does not compensate for. The blessed hammer missile makes it awkward to use this ability in many cases. Hammer of Zerae tries to be the single target killer no matter if you are building around weapon damage or spell casting and unfortunately falls short in both cases. Pros - The melee dodge is a useful stat that cannot be obtained anywhere else. Total character defence is a stat that benefits Amazons a lot due to their Balance passive, but is not that easy to get for most builds. Cons - Well it is a passive, and by its definition it has none apart from locking you out of the other Amazon devotions. The only other thing that is slightly annoying is the removal of the light radius. While this is no problem, and in fact looks cool, for 99% of the game - it is annoying in the pitch black of The Void uberquest limiting your vision considerably. Verdict - All of the active skills on the tree deal some form of lightning damage and so while the 1% lightning pierce per hard point may seem stingy at first, it powers both potential Storm Amazon flavours nicely. The big chunk of flat attributes also allow you to reach maximum block easily which works well with the intended sceptre + shield equipment combo. It also allows casters to reach good attack rating values without investing attributes into Dexterity and maintain open wounds via any of the WDM skills on the tree. Pros - Deals weapon damage and hits very rapidly. This makes it a potential candidate for some great crushing blow and "on Striking" triggers. Also deals an okay amount of lightning spell damage. Cons - The method of delivery is lackluster against stationary targets. While the hard point synergy expands the area of influence it also waters down the damaging hotspots which leads to an inconsistent damage delivery, on top of inconsistency in the numbers. Requires high levels of crushing blow to deal good damage. Unfortunately this stat does not synergise with the rest of the skills on the Storm Tree, which hit slowly and once at a time. Verdict - While initially the damage delivery can seem to be a moot point, it turns out to be a core flaw in the mechanics of the skill. Given, in some situation this skill can shine - for example if you can achieve an infinite density of monsters, which is present in the Secret Cow Level, and pair it with a certain shield called Danmaku the outcome is rather good. Unfortunately this dream scenario is not realised in almost any other case. Against stationary single targets this skill can be a real pain to aim, and ironically the more hard points you invest here the harder it will be. Funnily enough the 1pt version of this ability in patch XVc has the best hotspot density if you can tank your target in melee. Furthermore to get a good effect against average to regularly-large packs, they must be moving through the field. Because the field is centered on your character, this means you must be kiting them through it. If you are kiting them this in turn implies that you cannot remain still and get maximum dps out of Thundercrack. Given these observations I concluded that I liked both Thundercrack and Stormcall the most from the active skills. They both had clear drawbacks but also upsides which when built around could produce a viable build. Ultimately three main things turned me off the WDM route. First relying on Hammer of Zerae for my single target damage is unsatisfactory. The low damage multiplier and lack of multihitting means that this ability is better suited towards being the single target killer of a caster Storm Amazon and, everything else considered, is poor at this job for the WDM variant. Secondly I did not like the idea of being forced to stack 100% crushing blow for an ability which cannot reliably trigger it in a large variety of situations despite a hefty point investment, especially when Thundercrack scales very poorly with it. Not to mention that I also dislike being forced to use a certain rare and incredibly in demand item in order to get maximum value from the skill. Finally, I subjectively preferred a caster play style after spending most of my Median time the prior two ladders by playing WDM characters. So now that we have established we want to make a caster Storm Amazon around Stormcall we need to evaluate the strengths and weaknesses of our choice. Most importantly we need to think of ways to overcome the inherent deficiencies of the tree. The biggest shortcoming is the lack of a great single target killer spell. Naturally our first idea would be to look for an oSkill which compliments the build. This means it has to satisfy the following properties. Firstly it must be easily available. Even if an oSkill exists which would fit our build perfectly, it is no good for us if it only appears on rare items as it will break our first principle of levelling and playing untwinked. Thus I personally ignore any oSkills which are present on Sacred Uniques and sets, as well as super rare runewords using a Shaad and those made with Fauztinville great runes if my character is not suited to efficiently farming that level. Secondly the oSkill chosen should have some synergy with our build in order to achieve good performance. Finally we have to address any remaining. miscellaneous concerns when comparing between several viable alternatives. Applying this logic to the problem at hand, we begin by examining the Items with oSkills page in the documentation. We scan the Tiered unique, runeword and rare/crafted categories to look for viable oSkills. At this stage we end up with the following set: [Supernova (Amn Staff), Hailstorm (Fal Zon Helm & Rare Amulet), Orb of Annihilation (Kur Zon Helm), Brimstone (Rare Sceptre, Circlet), Devouring Cloud (Rare Amulet & Rare Gloves), Static Lance (Rare Gloves), Lightning Wall (Rare Staff), Psionic Storm (Rare Sceptre), Avalanche (Rare Staff)]. Now we consider which of those do not work well with your class skills or are not suited to the boss killing role. Orb of Annihilation is not a viable solution because it deals magic damage which does not scale and is bad against heroic bosses. It also forces us into Paragon. Brimstone has some synergy with Spirit of Vengeance, but unfortunately it requires us to obtain fire resist pierce which is not present on any items which ideally suit the build. Furthermore we have to give up our weapon slot, which is pretty much reserved for the Creep Runeword, and so cannot possibly be the top dps solution. Devouring Cloud A great skill on its own, but we have no innate scaling for it, items with poison pierce do not feature other useful affixes for us and poison damage is the worst element for boss killing as many are permanently immune to it. Psionic Storm Again another stand alone great skill. The magic damage does scale with Spirit of Vengeance. However because it is magic it is inferior to the elements in terms of boss killing. Avalanche A really good skill. While it is cold damage the existence of the Bona Dea runeword, which we will almost certainly use anyway, means that this type of spell is a viable choice. Unfortunately because it appears only on rare and crafted staves and giving up on the Creep is not an option we must pass on this one. Finally, evaluate the remaining options in terms of their mechanics and pick one most suited to the task at hand. Supernova Deals lightning damage which has synergy with our class skills and is well suited to killing bosses. Requires us to be in melee range of the target for maximum effect. Requires us to give up the Creep runeword. While the Amn-Xis version of this staff could be a viable alternative it will not be the best option as we will give up the Sorceress Morph. Hailstorm Cold damage, but this source is viable thanks to the Bona Dea Helm. Great skill mechanics - 10 second duration per cast means that we can stack the effect on the target and achieve incredible dps with our Sorceress cast rate. We can reach a very high level of this skill thanks to the helm + amulet combo. Weak against moving enemies and those heroics which teleport when struck. Static Lance Lightning damage. However the level of the oSkill present on the item is not very high and it's raw damage is also not great. Lightning Wall Lightning Damage. Has 1 frame next delay which constrains the damage output. Also only present on staves and like before, if it forces us to give up the Creep it cannot be the optimal solution. Therefore we can see the best option is by far Hailstorm. It can be used from the early game through the endgame, it has synergy with our build thanks to a great low level runeword and it has a great damage output thanks to its mechanics. The second major drawback of the Storm tree are its overall mediocre defensive capabilities. Because we will forfeit the ability to block while we have a staff equipped we have to rely only on Balance + the 5% TCD per slvl we get from Asterism. This has several implications. Firstly we will be maxing Balance, it has very good increasing returns with hard points and it will increase the amount of total defense we gain for every 1% of TCD. Secondly we will need to max out Asterism despite the fact that the majority of its bonuses increase without hard points. Because TCD is a stat that is very hard to accumulate from gear alone and because of the presence of Balance however this will be worth it. Lastly these decisions also lead us to the conclusion that we should be prioritising the application of 15x TCD mystic orbs to every armour piece. The one exception is the chest where going for 350% Enhanced defence first and only then TCD will yield the best total defence. A corrolary to the above logic is that crafted items increase in value, because they have double mystic orb effect and so allow us to reach the best defence that we possibly can. Furthermore we will need some way to replenish our life in combat. Our skill tree does not offer us anything in this regard. As a caster our itemisation options here are rather limited. There is only the Life after each Kill stat and also the proccing of several healing spells - however this option is exclusive to poison spells. Therefore we will be orbing our weapon with 15x Life after each kill orbs as a priority. In the midgame we will also craft jewels by using an On rune and aim for at least +3 LaeK on every single one. The double MO orb effect on the weapon and the stacked LaeK from every free socket will provide us with a decent solution to combat healing. The last question we need to address is how we will flesh out the rest of our skill point distribution. As mentioned above we will be maxing both Balance and Asterism. Stormcall is our main AoE clearing spell so that too must be maxed. Now in terms of uber skills there are two candidates. Paragon is the defensive option, which will give us a big life total in exchange for socketing gems. Spirit of Vengeance will buff the physical portion of Stormcall quite significantly and also provide some survivability thanks to the maximum life increase aura, the fact that she is immortal and the meatshields she generates. One observation that can be made while levelling with the build is that Stormcall by itself does sufficiently high damage to clear out the regular Destruction content. Furthermore we can see that the vast majority of the early uberquests are heavily biased towards single target damage. With those two facts in mind, the better choice for an uber skill to begin with is Paragon. The huge life bonus will enable us to survive very well and SoV would not benefit Hailstorm anyway so would not be so useful during the beginning of our uber journey. Furthermore in the early game we are using a tiered unique weapon and shield. Filling 6 of those sockets with perfect diamonds for spell damage and the other 6 with bloodstones for minion resistance is clearly superior to using jewels so we might as well get the great vitality to boot. In the midgame once we make the Creep runeword we give up these 12 sockets for which gems are superior to jewels. Therefore we will only have 16 sockets for gems, which means Paragon will not provide enough bonus vitality to be worth it. Also because at this stage of the game we have the latent AoE power to start clearing all of the uber levels, switching to SoV and boosting your Stormcall further is the logical choice. Her aura grants 5% fire & physical/magic spell damage per slvl and we want to max it out as the use of an oSkill for our single target freed up many points. Finally we are left with around 20 points to distribute in various utility skills. There are three major candidates. The first one is Wild and Free. The velocity bonus it provides is very important in enhancing our mobility, because the Sorceress morph is much slower compared to the Amazon. Then we have Defensive harmony, which enables you to slow down all monsters which strike your fire elementals with weapon damage. If the elementals are tanky enough to withstand several hits and also not waste our dps time, by requiring frequent resummonning, this passive can grant excellent crowd control. Lastly there is Spellbind. Hard points here reduce the otherwise long skill timer (with diminishing returns), which will allow us to teleport sooner after casting it. It also grants a massive life bonus to our elementals enabling them to survive adequately with only one point in that skill and no minion defence stats on our gear. Because of the diminishing returns of the timer reduction, and because we only need just enough minion life to make our summons grant defensive harmony a decent uptime we will be putting 10 points in spellbind. This leaves us with 2 points into wild and free combined with the choice of a body armour without a velocity penalty to take care of our movement speed. Finally we jam all remainders into defensive harmony and in the midgame this is still enough for 35%+ slow. Of course in the early game, because paragon requires only a single point, we are free to allocate more into defensive harmony to reach 60% slow as well as higher movement speed and even more minion life. I have already identified a few key items - the Creep runeword and the Bona Dea runeword - in the previous section. This is because the processes of picking skills and picking gear have a lot of intersections and in practice are not conducted in isolation. For example you can choose between two different skills based on which one scales with cheap gear better. Now we analyse our skills and decide what affixes to look for on our items. As previously discussed our main skill Stormcall does both physical and lightning damage, and our secondary - Hailstorm deals cold. There are three ways to scale their dps. Casting more per second, increasing their damage and decreasing the resistances of the monsters. Asterism gives around 50% lightning resistance pierce when maxed. Combining this with Bona Dea, which gives another 40%, and at least 25% from charms we can see that there will be no need to ever look for lightning pierce on our gear as we will have 115% of the stat by default. Not to mention that more pierce is bound to appear on any crafted items we use as a side effect of using Ornate shrines even if we are only aiming to maximise the spell damage roll. Because the "reduce enemy physical resistance" stat does not exist the physical portion of our Stormcall will always be applied at face value. While this is clearly a downside it's not something to cry over for two reasons. Firstly we have spellbind, which debuffs enemies with -50% physical resistance. While the spell timer and small aoe do not allow us to spam this ability all the time it can be used to speed up the demise of lightning immune enemies, and it also makes our physical damage viable against heroic bosses. Secondly, physical is the damage source with the least amount of resistant/immune enemies in the game. The vast majority of enemies you face will have 0 physical resistance. In terms of Hailstorm, we only have 40% pierce from Bona Dea and another 25% from charms. Therefore cold pierce is definitely a stat we want to reach at least 100% in for the regular game and at least 150% for the tougher heroic bosses. This is easiest to achieve on rare jewelery and it fits our concept because we will be using a rare amulet to get the oSkill in the first place. In terms of boosting damage, bearing in mind we deal 3 sources of damage, clearly the "spell damage" affix is the best because it affects the entirety of our arsenal. The next best stat is "lightning spell damage". This is because it applies at double efficiency thanks to the high amount of pierce we get for free. Last is the "physical/magic spell damage" stat. Cold spell damage is unnecessary to focus on because Hailstorm paired with the Sorceress cast rate already deals incredible damage and we get a big chunk for free on Bona Dea. Additionally, an increase to All Skills is strictly preferred to an increase in Amazon skills because it also boosts the damage of Hailstorm. Last but not least are Energy Factor and Energy. They affect all our spells but are hard to stack unlike the rest of the affixes. Meaning that there are no items in the game, for this build, which are good solely because they have Energy factor and no other damage stats. So you will never have the choice between focusing on Energy factor or ignoring spell damage for example. Therefore we try to get as much as possible while rolling jewels, but otherwise it's just a side addition. With regards to the cast rate there is only one choice - the Creep. It shaves 3 frames off the animation and leads to a huge total dps increase. Fortunately for us the rest of the stats are also godly. 10 all skills, faster cast rate, spell damage, + max resistances and the proc is helpful for crowd control and dealing with lightning immunes too. As you can see this weapon affects every single side of the "caster dps triangle" and so it is the best. 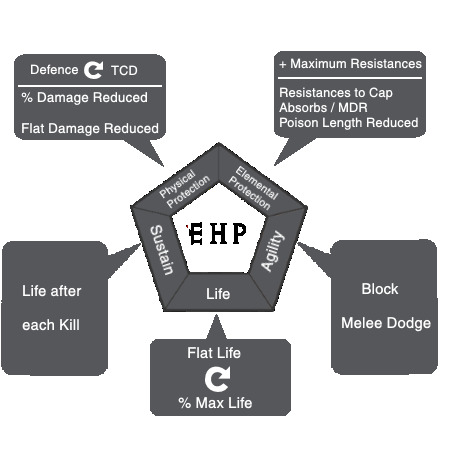 Take a look at the below diagram which summarises the factors we just discussed which affect your damage per second. All of the stats are listed in descending order in their categories. This means that the stats which affect your dps the most are on the top. If you find an item you can quickly evaluate it depending on how many of the stats listed here are present on it and also compare it with others in the same way. We have two main defensive skills. Balance - which grants a big amount of flat defence and Asterism - which grants 25% melee dodge and a Total Character Defence bonus. So in terms of physical damage we know that defence and TCD always go together. If you have one from a skill then you should always focus on the other on your gear. In our case we have both, but Balance is of a greater magnitude. Therefore we prioritise 15x TCD orbs on every single armour piece apart from the chest (and shield on single player). On the chest it is more efficient to go up to 350% ED first (because of the TCD from Asterism) and only then go for TCD mystic orbs. Another aspect to physical protection is the Damage reduced stat. One useful rule of thumb to remember for it is the following: the less defence you have the more effective percentage damage reduction is. To give a simple example - let's say I have a Bowzon with Ecstatic Frenzy, 10k life and no damage reduction. If an arrow which deals 5000 physical damage is flying my way I will take an expected 4750 damage (95% ctbh). If I have 50% DR I would only take half of that. That is, 50% damage reduction blocked 2375 damage. Now lets say I turn Ecstatic Frenzy off and I have 100k defence, which gives me a 30% chance to be hit. With no DR I would take an expected 1500 damage. With 50% DR I would take 750 damage. Here the damage reduction stat is only blocking 750 damage. So because we will never reach the insane defence values of a Spearzon for example, damage reduced is a very strong stat for us. Therefore we should try to get as much as possible up to the 50% cap. So here we have yet another filter which you can judge items through - if two belts have similar offensive values but one comes with 10% DR you know which one is optimal to pick (hence we aim for 30% dr on midgame and 50% on endgame gear). Apart from percentage DR there is also flat DR. However, as with the energy factor, this stat is hard to stack and so is not something you should hone in on - it's enough to be aware of its usefulness and take it into account if it appears on a candidate item. Apart from physical damage, you also have to protect yourself from the elements - fire, cold, lightning and poison. The most important thing to know here is: additional maximum resistances provide exponentially more protection. Time for another quick and dirty example. Let's say you have 75 fire resist. A 1000 damage fireball will hit you for 250 damage. Now you go and obtain Azmodan's charm which raises that max to 80 - now said fireball will only deal 200 damage to you. So that extra 5% max res reduced the incoming damage by 20%. Afterwards you go and do the Kabraxis uberquest and roll a charm with another +5 max fire res. Now the fireball deals 150 damage, so adding another +5 max res reduced damage by (200-150)/200 = 25%. The first +5 max reduced damage by 20%, the second by 25%. Of course it is important to always raise your resistances to the cap, otherwise you are wasting its potential. There are also absorbs and magic damage reduced, but again, these are not easily stackable so think of them as a nice bonus for elemental protection if they show up on otherwise desirable gear. Same for poison length reduction - this one is a good candidate for ring mystic orbing if you have the free space. Another aspect to survival is sustain. Since we are a non-poison damage spellcaster we only have life after each kill. Hence we try to get as much as possible via orbs on our weapon and on crafted jewels. We try to pick items which also feature this stat (see endgame gear for example). Lastly we have the one stat which protects you against everything - your life. The relationship here is similar to the defensive one. The more flat life you have, the better percentage life increases become and vice-versa. Because our Spirit of Vengeance uber skill comes with a decent percentage life bonus we should prioritise stacking flat life first. Hence why we roll for flat life on all our jewels and look for this stat on our rare amulet and crafted chest. Below is the diagram which summarises the above considerations for this build. Again the stats in each category are in descending order. If you wish to compare items on their defensive merits you can easily do so with this tool. For example, yet more verification that the Creep runeword must be the best in slot weapon - not only does it provide every single important DPS stat - it also grants +5 max resistances for great elemental protection. How good you, and by extension your characters, are at Median is in my opinion a function of mainly three variables. They are, in no particular order, your knowledge, equipment and character control. The interesting thing here is that none of these three are independent but overlap with each other in different proportions to create your "Median Self". Now this all sounds very abstract for the moment, but bear with me I'll get to the point soon. Let us assume we have three different Median players in front of us. Let's call them A, B and C. Player A is extremely knowledgeable - this allows him to circumvent challenges without playing very well or having optimal gear. Player B has best in slot gear which allows him to brute force his way past any difficulties despite not being 100% certain on how stuff works and what he is doing. Player C has very good character control. He has fast reaction times, good keyboard & mouse APM and "sees ahead" - knows where he is supposed to move 5 seconds from now and what to do 10 seconds from now. This allows player C to complete the same challenges as A and B despite having suboptimal gear and no encyclopedic grasp of mechanics. A, B and C are exactly equally skilled. Of course in the real world no such players exist - the distribution of knowledge, equipment and character control is a lot more balanced - but this simplified example helps illustrate my point. Which is: if you wish to get good at the game you should focus the most on improving your character control, because it is the most transferable and the most flexible nuance of skill. The easiest form of skill to obtain is the gear. In Median like most other ARPGs the power level of the rarest equipment is high enough to pretty much make your character a god. Unfortunately it is also the least transferable. The gear that makes your Storm Amazon godly is vastly different from that which makes your Tantrum Paladin godly. Furthermore good gear can be obtained without the necessary level of effort on your part - giveaways from friends / end of ladder season etc. Your knowledge of Median is your ability to know what needs to be done to overcome a particular situation, combined with understanding the game's mechanics. This is the sort of stuff that is easiest to learn from guides or by talking to other players. The majority of this knowledge is transferable - once I know how to beat Brother Laz with my Amazon, I can also beat him with a Sorceress for example. The problem is that there are pieces of information which make overcoming a challenge with a certain class or build trivial, much faster than any other way, but often do not work with other characters. This is the so called "cheesing". Cheesing is undesirable because it cannot be applied across every character and it can also be unfair in exploiting the limitations of a closed source game engine. Also because it is by definition the fastest method of overcoming challenges, it is the main reason why character progression after a ladder reset is so rapid and hence why the economy so quickly deteriorates to the point where only super rare items are traded. Character control is the only skill which matters in every single part of the game, is equally useful to all builds and can be applied across the largest number of situations. Improving this ability means you don't need to be a good UHC player, or a good Paladin player, or a good Paladin & Assassin player. You can graduate straight away to being a good Median player with fully transferable skills. "That's all fine and dandy SB", I hear you say, "but how do I improve my character control?". Well I'm glad you asked! This is where our totally abstract and unrealistic example is extremely helpful in providing us with the answer. You practice character control by playing as much as possible as player C. We already covered one example of this in part I. - leveling with your planned build untwinked from the start, no matter if more efficient alternatives are available. Do as many ubers as possible without changing your build or using a different character. Finish the content before you outgear it. As an example from my guides - don't transition to midgame gear before you have completed the Easy ubers first. Don't aim to always use the rarest and best gear. Never take handouts from other players and if you are new never accept a rush. Don't trade for a charm without first seriously sitting down and giving the uber your best go. Try to complete the uber any way you can, first with help from other players, then alone but with cheesing, then alone without it, then alone without cheesing and dying etc. This concludes the workshop. I hope that my theorycrafting methodology will be useful to you and I look forward to seeing your own build brews in the future. Will you write more guides? Maybe. The plan right now is to do two more in-depth guides for characters other than the Amazon and Paladin. One for mxl2016; and one when the first major content patch is released on the Sigma "engine" (if I am still active at this time). However my priority will be updating the existing guides to the new version(s) first. Why bother writing all this "theory" stuff in your guides when very few people will actually read it? Because it is interesting to me. One of the best ways to crystallise your understanding of a subject, in general, is to teach it to someone else. Also because it is something you cannot read about anywhere else. Anyone can tell you to put points in X and equip Y on Z, but very few can provide an analytical framework applicable to all characters and even fewer still would be willing to go through the effort of writing it all down for everyone. Besides I did not get into this guide-writing racket for the popularity. Can I PM you with questions on your builds? I would prefer it if you posted in their threads. This way I don't have to answer the same question multiple times. I asked a question but you didn't reply, halp? Brother Laz for creating the best ARPG out there. Even though he left us like an abusive father he's still family. Marco the swiss knife development powerhouse. (when he's not taking a tactical... break) For making it even better and for everything he's done for the community. The whole TSW crew whose hosting machines put their lives on the line every day, just so people can ask "server down?" ad nauseam. Why in Early game skill plan we taking 20 in defensive? Mb better choice will do 15 defensive and spend 5 in paragon/wild free/etc? Edited by OnlyForFun 3 years. @only - only slow vs bosses is capped at 50%. You can slow regular enemies more than that. Those 10% extra slow are great when entering Dest since we always have 25 elementals and can spare the points. Also, those dividers are fine for me at 1920x1080 res, but yeah true they might need cropping now that the post width is lower. If with my account or ban I can upvote you, I will.